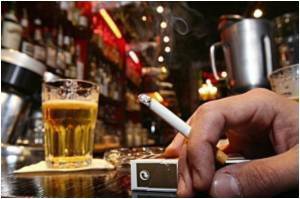 Study IDs new genetic links to impulsivity, alcohol problems in men ~ Health Matters Today! Being impulsive can lead us to say things we regret, buy things we really don't need, engage in behaviors that are risky and even develop troublesome addictions. But are different kinds of hastiness and rashness embedded in our DNA? A new study suggests the answer is yes -- especially if you're a man. The research, led by University of Nebraska-Lincoln assistant professor of psychology Scott Stoltenberg, found links between impulsivity and a rarely researched gene called NRXN3. The gene plays an important role in brain development and in how neurons function. The newly discovered connection, which was more prevalent among men than women in the study, may help explain certain inclinations toward alcohol or drug dependence, Stoltenberg said. "Impulsivity is an important underlying mechanism in addiction," he said. "Our finding that NRXN3 is part of the causal pathway toward addiction is an important step in identifying the underlying genetic architecture of this key personality trait." For the study, researchers measured impulsivity levels in nearly 450 participants -- 65 percent women, 35 percent men -- via a wide range of tests. Then, they compared those results with DNA samples from each participant. They found that impulsivity was significantly higher in those who regularly used tobacco or who had alcohol or drug problems. The results, interestingly, also came down along gender lines. In men, two connections clearly emerged; first, between a particular form of the NRXN3 gene and attentional impulsivity, and second, between another NRXN3 variant and alcohol problems. The connections for women, meanwhile, were much weaker. Stoltenberg said the gender-specific results are a rich area for further study. "We can't really say what causes these patterns of association to be different in men and women. But our findings will be critical as we continue to improve our understanding of the pathways from specific genes to health-risk behaviors," he said. The researchers were interested in impulsivity because the trait can predispose people to any number of behavioral problems -- addictions, behavior control, failing to plan ahead or think through consequences of actions -- and settled on the role of NXRN3 from previous, recent studies. While the results add important new evidence to the genetic role in impulsivity and, in turn, its role in substance abuse, researchers were careful to not claim a perfect cause-and-effect relationship. Impulsivity may interact with sensitivity to alcohol, for one example, or anxiety, for another, to create complex pathways to substance use problems in both men and women. "If you're working to explain how genes are associated with something like (substance) dependence, you have to connect a lot of dots," Stoltenberg said. "There's a big gap between genes and a substance use disorder. Impulsivity is one factor to such problems -- not the only factor."